We’ve been hard at work! Four of our colleagues have been promoted and two have new certifications. 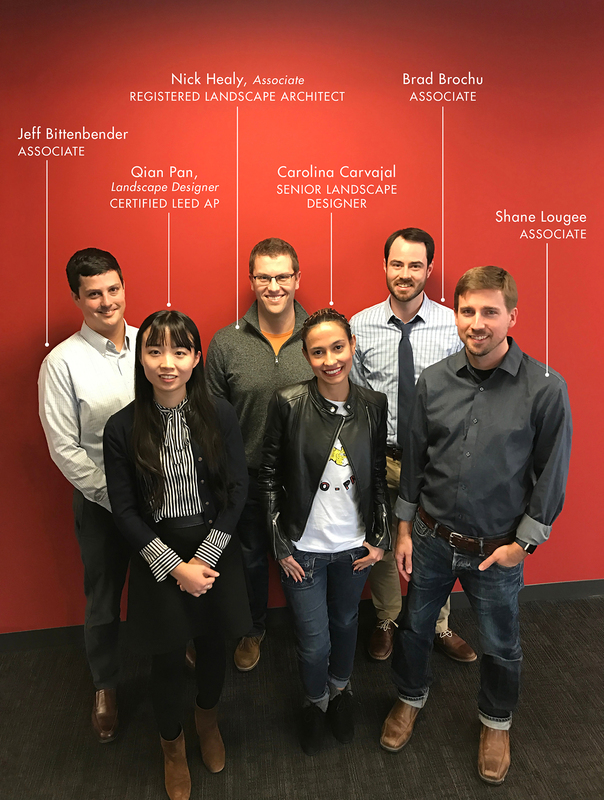 Read about the projects they are working on and what inspired them to pursue a career in landscape architecture. Jeff is currently working on the University of Rhode Island’s new engineering building; the Cambridge Watertown Greenway project to unify the new linkage with adjacent greenway segments; and the Merrimack Riverwalk project which is a continuation of the existing Lowell Merrimack Riverwalk. Brad is currently working on Citizen’s Bank Headquarters Corporate Campus; and Draper Labs, an architectural renovation to existing atrium. Both are currently in the construction phase. Shane’s current projects are: New England Conservatory Streetscape and Student Life & Performance Center which is currently under construction; and Soldier Field Park Renovation which is both in the design phase and under construction. Carolina just finished working on the Edward Devotion School, a public K-8 school; and Middlesex School, an independent 9-12 boarding school. She is currently working on the Lawrence Rail Corridor, Kenyon College, and South Bank Bridge. Nick is currently working on the revitalization of the First Church of Christ Scientist, Plaza and Taipei Phase II NOC Project in Taipei, Taiwan. Qian is currently working on the Constitution Center project in Charlestown, MA; and the Lynn Gear Works Residential Project in Lynn, MA.